I started to be coached by Benny and Coach Lin since May 2007. Within just over year, I have learned and improved so much that I won my first title in Novice for 10 and under and the Champion in Hong Kong Inter-Primary School Tennis Competition 2007-2008 in June 2008. 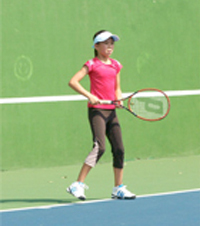 I would recommend any kids who like to play tennis to join Benny Lin HKITA; it would boost your ability and confidence. The coaching and training sessions are so fruitful and enjoyable. Oh, it is also so awesome!! Benny Lin and Coach Lin coaching techniques and training styles are outstanding and cater for beginner right through to professional levels. The tennis drills are unique. The sessions are not only a great way to improve your game but are also fun and hugely improve your fitness. Benny Lin and Coach Lin are absolutely brilliant with children and are able to get the maximum potential and skill out of each child he coaches.